The FTD® Contemporary™ Rose Bouquet blooms with a modern sophistication that will bring a rich romance into their everyday. 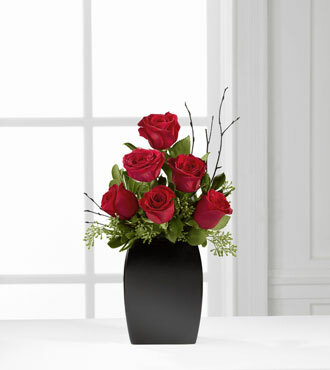 Brilliant red roses are accented with lush greens and black painted branches for an incredible look. Placed within a black ceramic vase this flower bouquet creates a stunning impression to help declare your love with each exquisite bloom. GOOD bouquet includes 6 stems. Approx. 17'H x 12"W. BETTER bouquet includes 9 stems. Approx. 21"H x 14"W. BEST bouquet includes 12 stems. Approx. 23"H x 16"W.